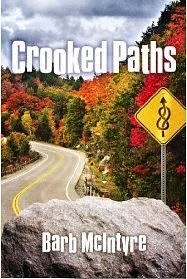 Crooked paths is about women who rely on each other during a life-changing two year period. They share extremes of happiness and grief with humor, wit, and generosity. The cover comes from one of the characters who describes life as a drive where we have to navigate past of conflicting traffic signs, take detours, and spend time in slow speed zones on winding roads. She also says that the road is often filled with boulders to either climb over or go around. The women in this book are not only friends, but work together and help each other through good and bad times. I hadn't planned to actually write the booklet that the women often refer to, but once I started it took on a life of its own, and it was more fun to write than the book itself. I also learned more than I wanted to about what happens when a car crashes. "The courage, strength and bond these women share is remarkable, something many can be jealous of. There were some intense emotions throughout the book that would have you laughing or feeling such awe for them."